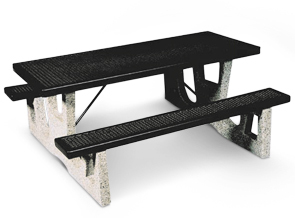 Enduring color of thermoplastic coated steel tops and bench seats combined with steadfast precast concrete frames amount to a vandal resistant picnic table that will fashion almost any setting. Thermoplastic and concrete color options are available as shown. Some assembly required. Tops & Seats - Expanded Thermoplastic Coated.